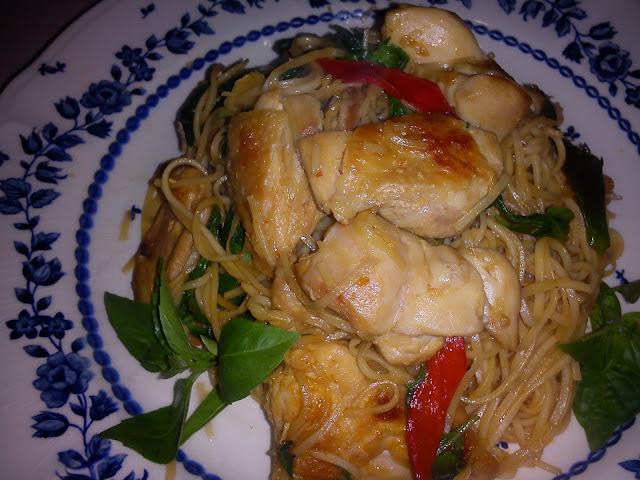 Another dish without meat which I prepared with fresh mushrooms. There are various types of fresh mushrooms in abundance in Xiamen. 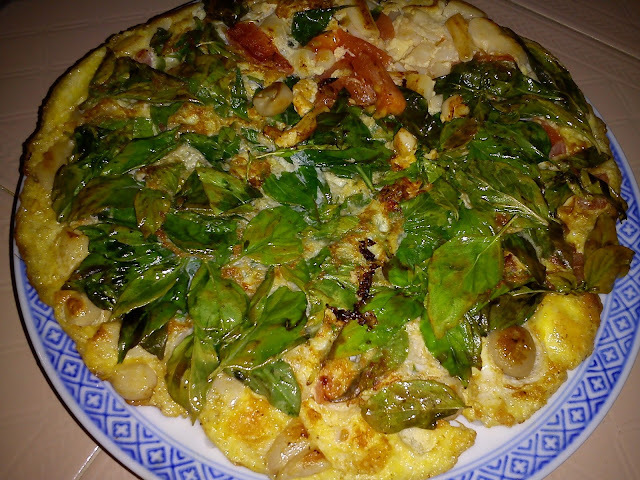 I cooked this tomato egg foo yong [omelette] when my neighbor gave me a bunch of Basil leaves from his garden. 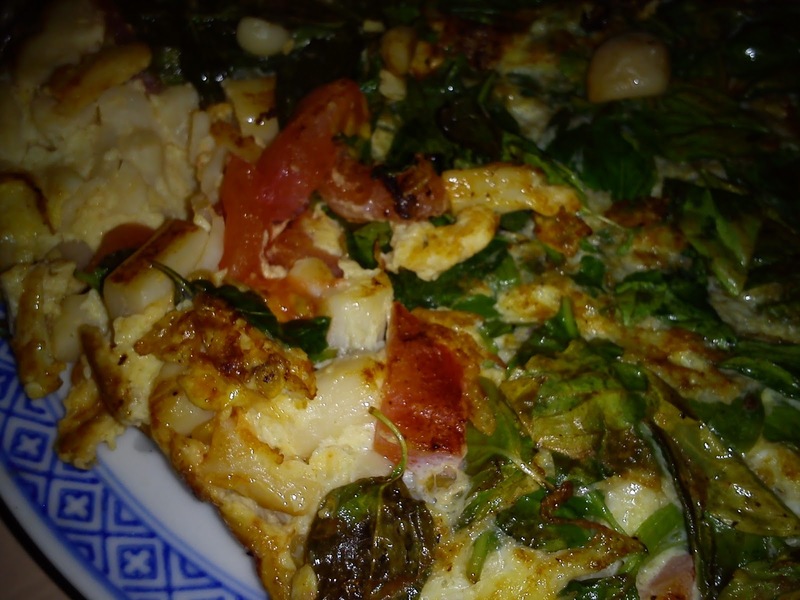 This is a healthy omelette with tomatoes, fresh mushrooms [I used White Crab mushrooms], basil leaves and eggs. The omelette is very aromatic with the basil leaves, the soft tomatoes are sourish and the mushrooms are crunchy and sweet. 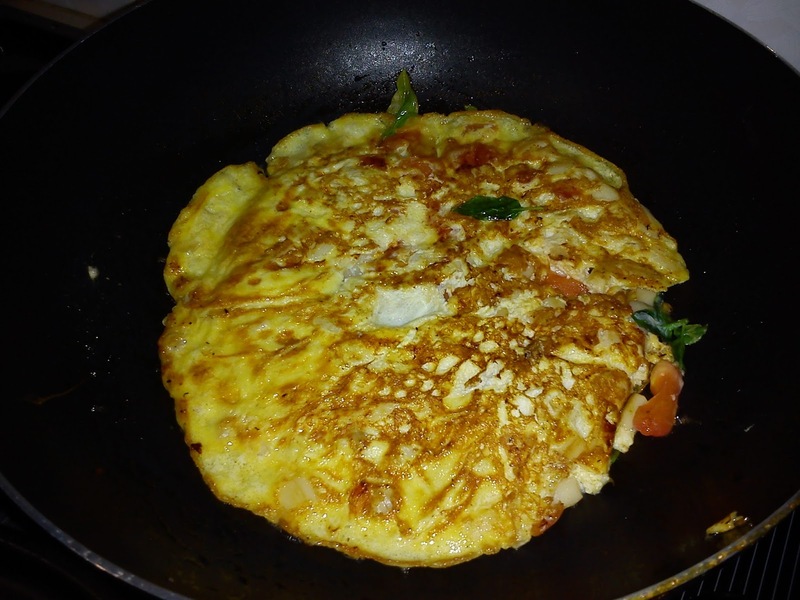 Lovely omelette which is soft, moist and tasty to go with rice. 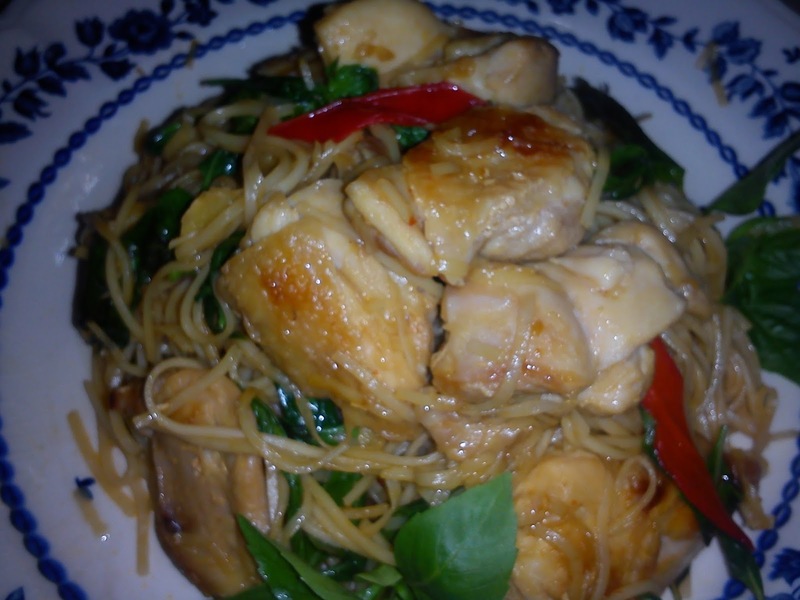 I believe this is a healthy dish packed with ample nutrients. 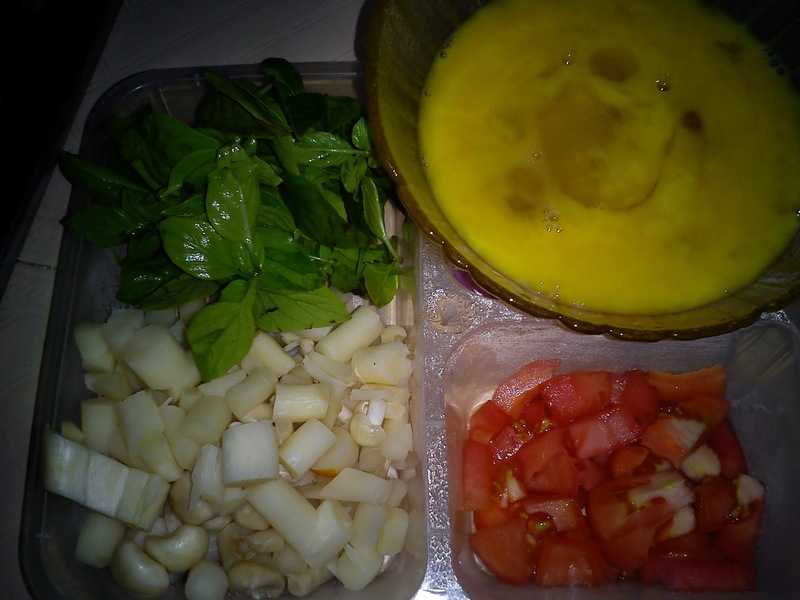 Mix seasoning ingredients in a bowl and add in the eggs. Lightly beat and set aside. 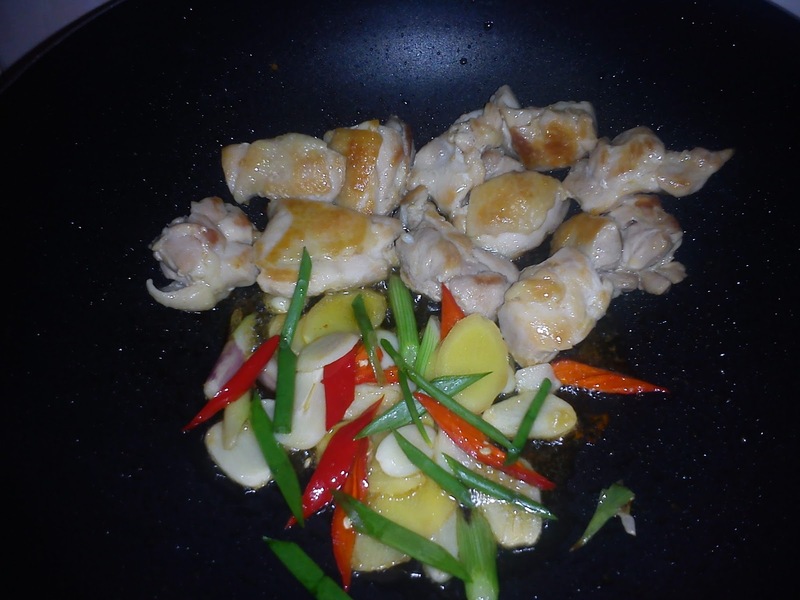 Heat up a non-stick wok without oil, stir fry mushrooms until water oozes out and almost dry. 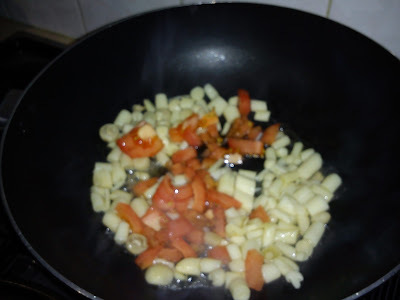 Add in 1 teaspoon oil and tomato. 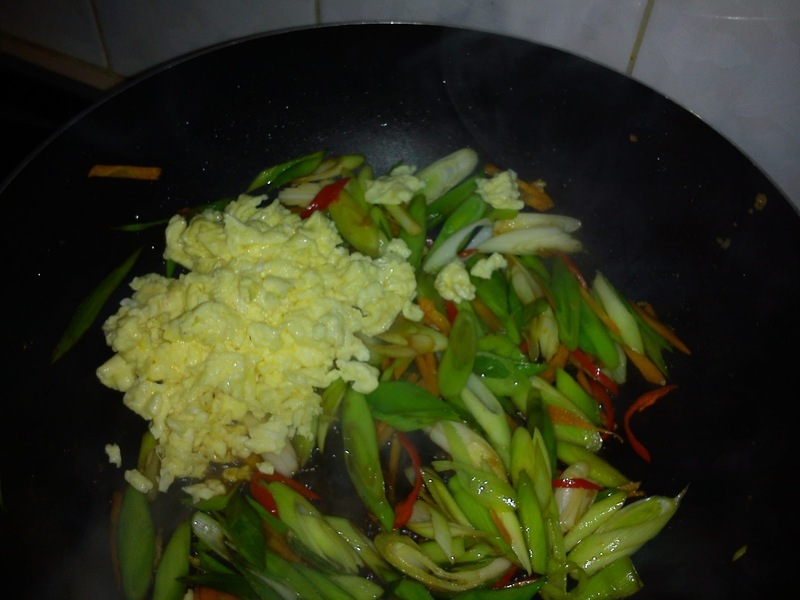 Stir fry to mix well and dish up into egg mixture. 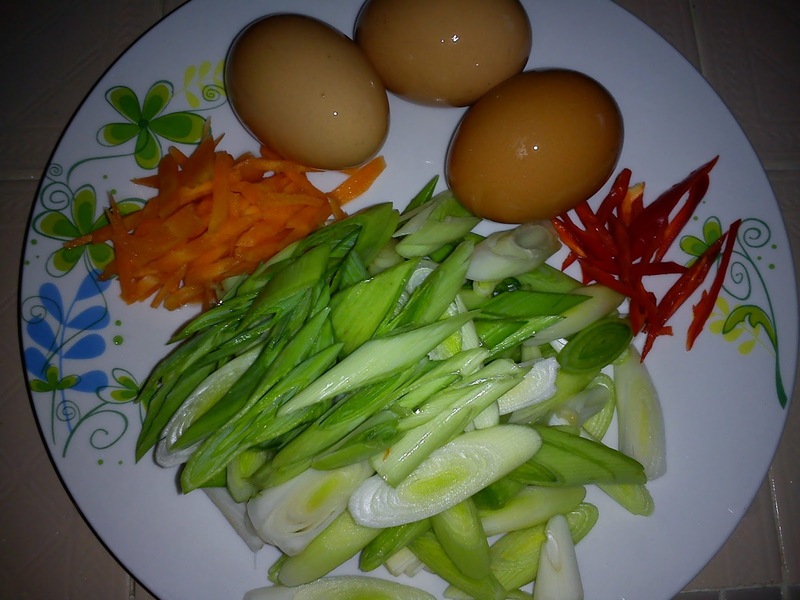 Heat wok with 1-2 tbsp oil, pour in egg mixture. 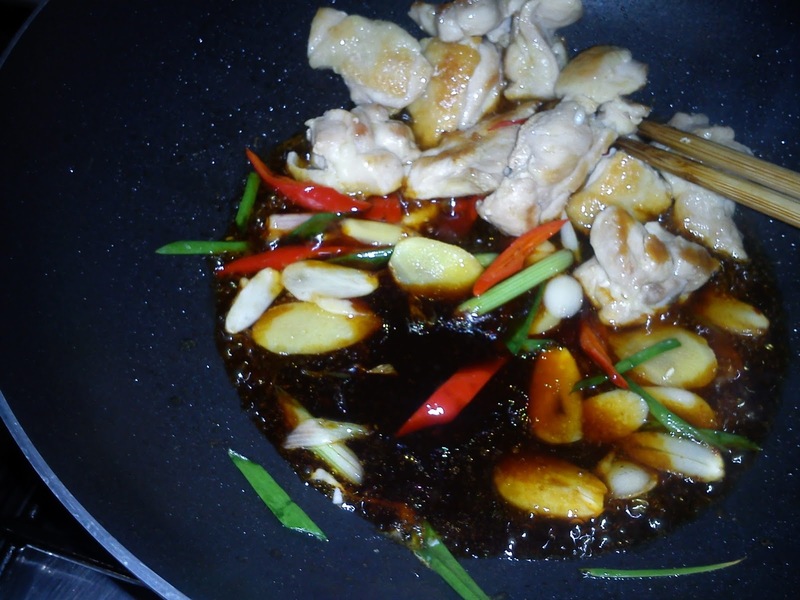 Shake the wok a little to spread out the mixture. Fry over low heat until the edges are firm. 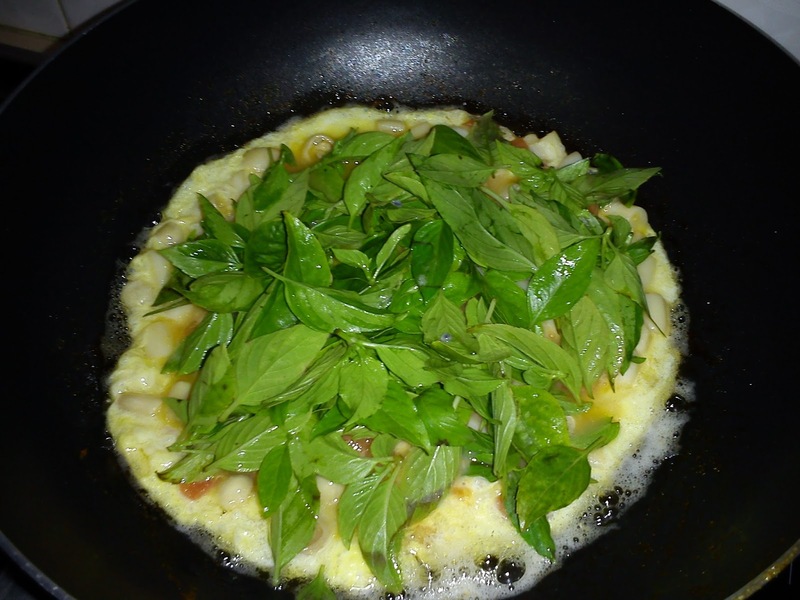 Spread basil leaves over egg omelette and fry until the omelette is brown at the edges. 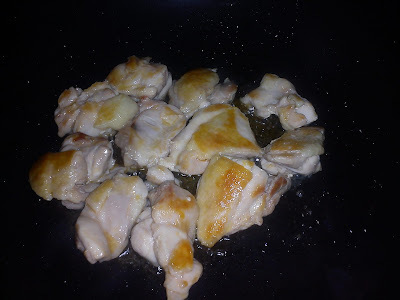 Flip over to fry the other side until cooked. Dish up onto serving platter. After having too many sumptuous meals while in Xiamen, I do miss this kind of simple dish which comes to my mind while planning my meals back home. I told myself, I must cut down on meat and seafood for awhile. 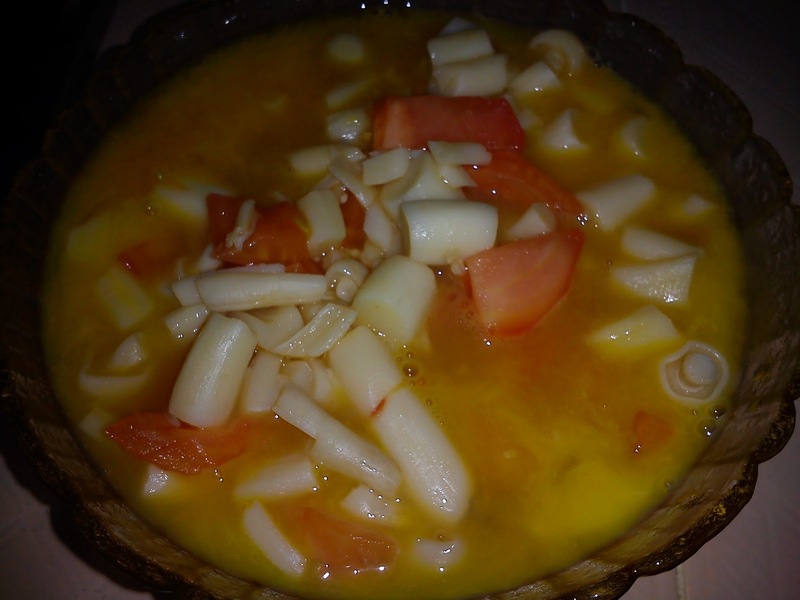 BTW, most Chinese dishes I had there were rather oily except the soups. This stir fried vegetable dish is quite similar to the Stir Fried Chives with Prawns and Eggs. The difference is in the vegetable used and the way to make the scrambled eggs. 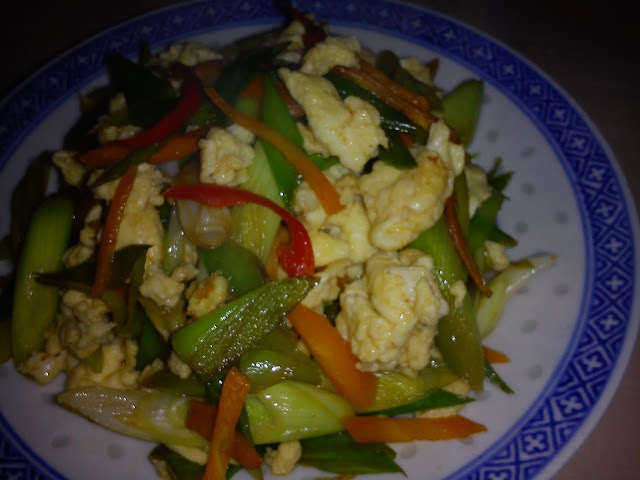 Here, I used leeks and eggs only. 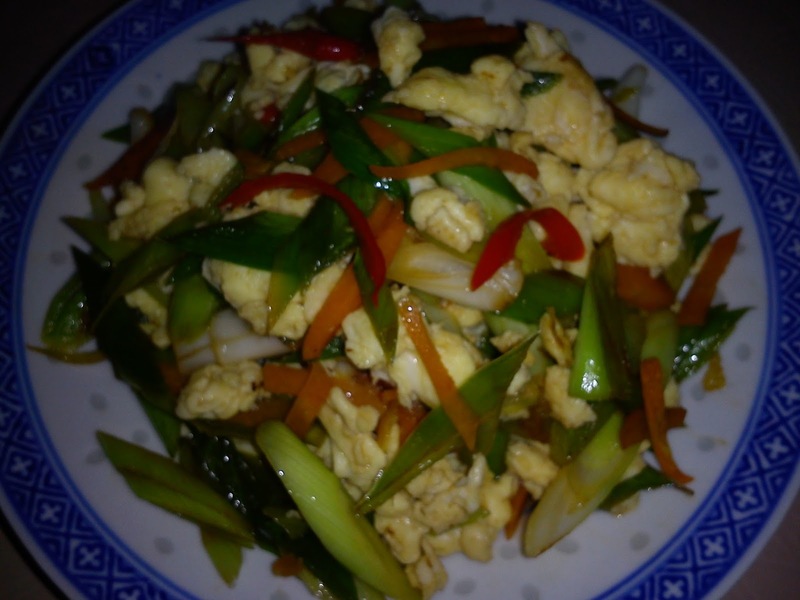 The proper way to make scrambled eggs is to mix eggs with some water and fried quickly until soft and cooked, then dish up and return to the wok after frying the vegetables. 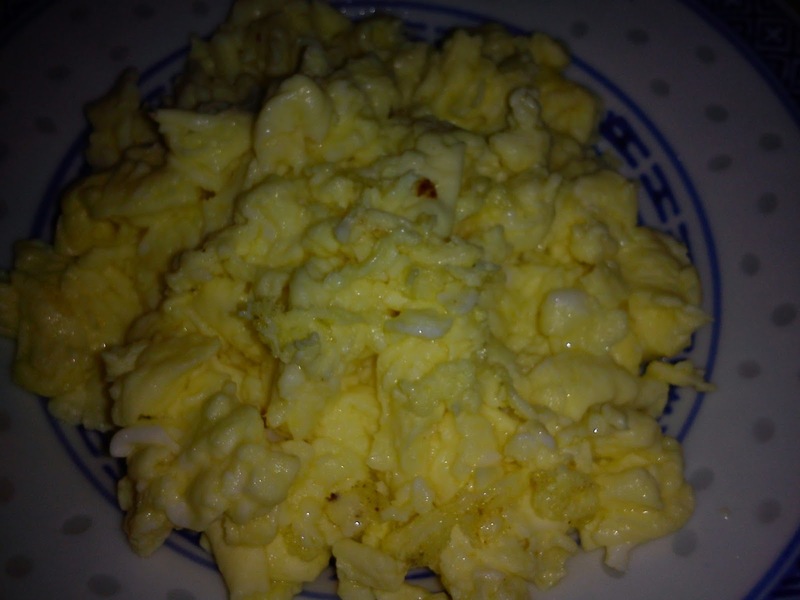 The fried eggs remain soft and moist. Heat 1 tbsp oil in a non-stick wok, pour in the egg. 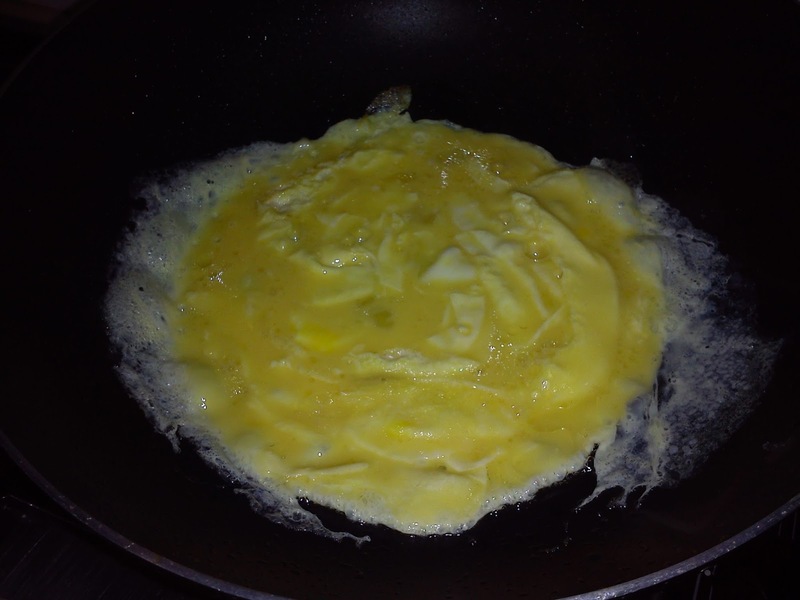 Quickly start stirring the egg until cooked and still soft. Dish out and set aside. Heat 1 tbsp oil, sauté some chopped garlic until aromatic. 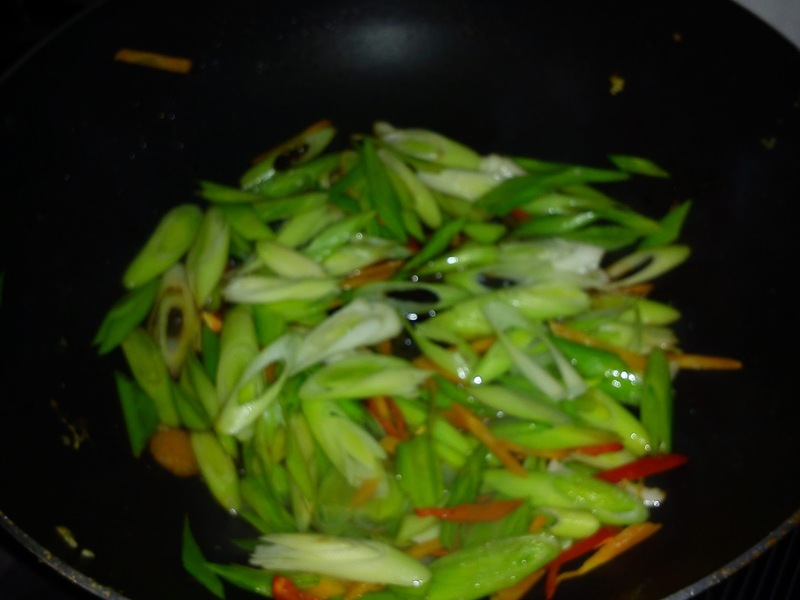 Add in the leeks and red chilli. 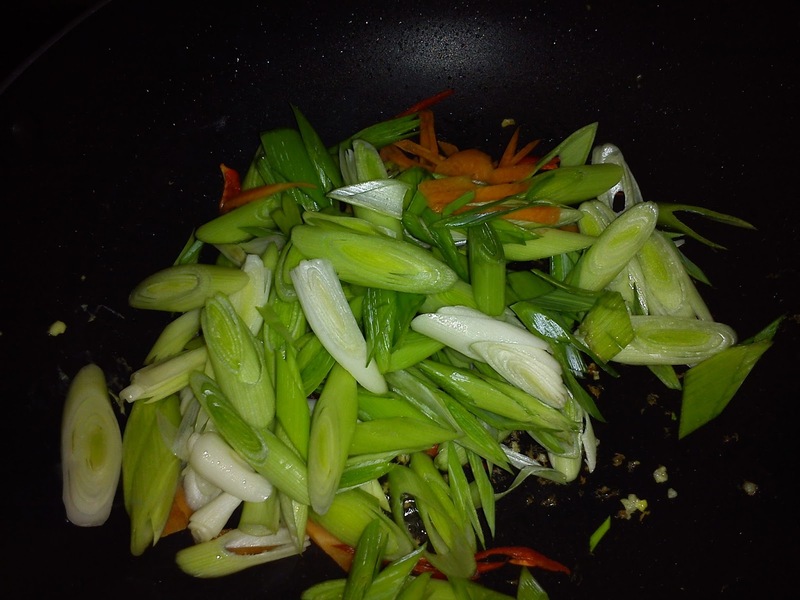 Quickly stir fry until leeks turned bright green colour. 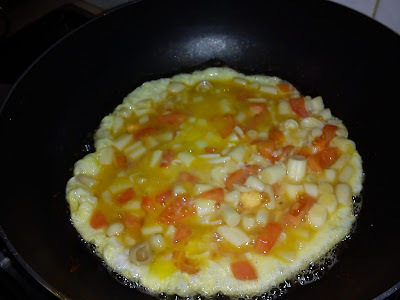 Add in seasoning to taste and fried eggs. Stir well and dish up to serve. While in Xiamen visiting relatives there, I wanted to try their Sar Cha Mian, Prawn Noodles etc. after having rice for meals for several days. 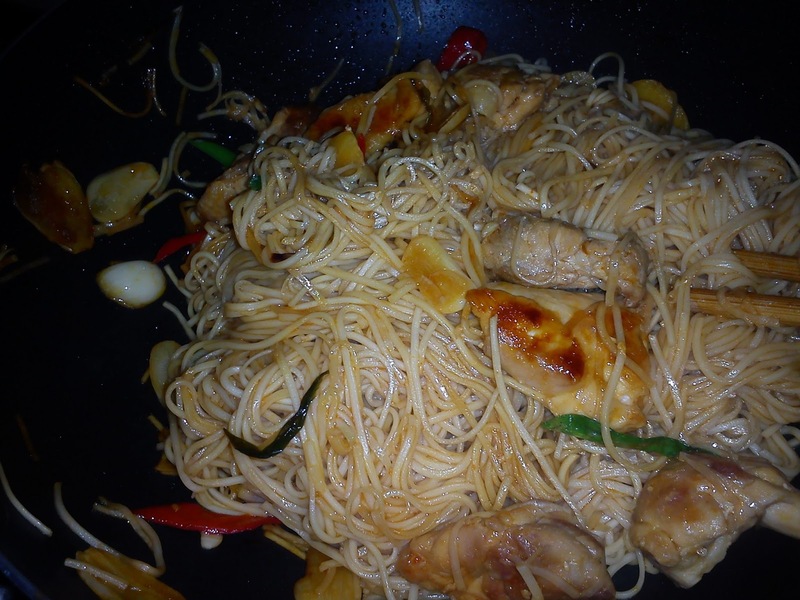 But I was told that noodles are mostly eaten by not so well to do families. The more well off people will have rice for lunch and dinner. 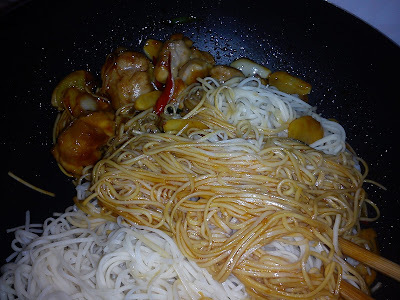 I was tired of having rice and sneaked out to try Xiamen noodles. 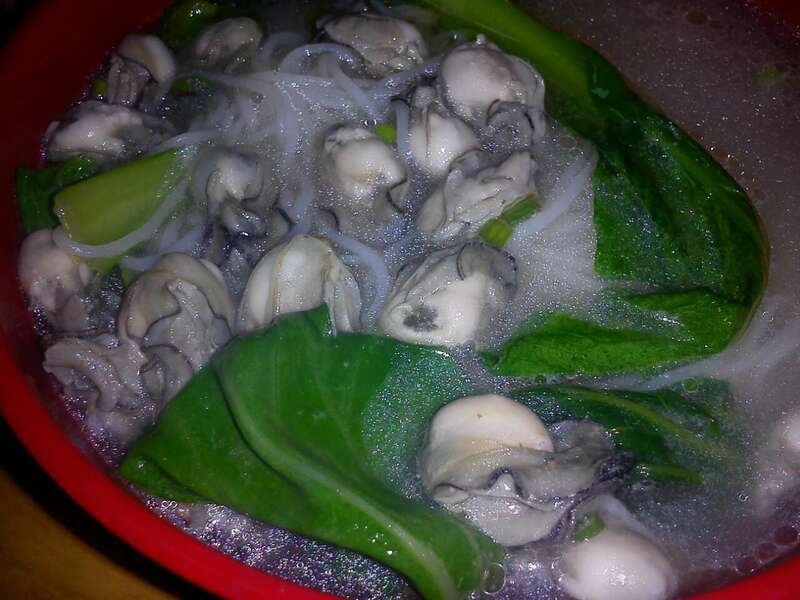 The fresh oysters with hand-made noodle soup and Sar Cha Mian that I had were good. 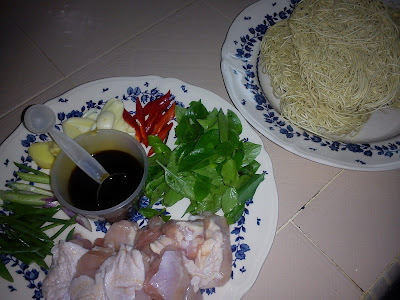 Back in Malaysia, the first meal I had at home was this San Bei Chi with noodles. This is something new to me. 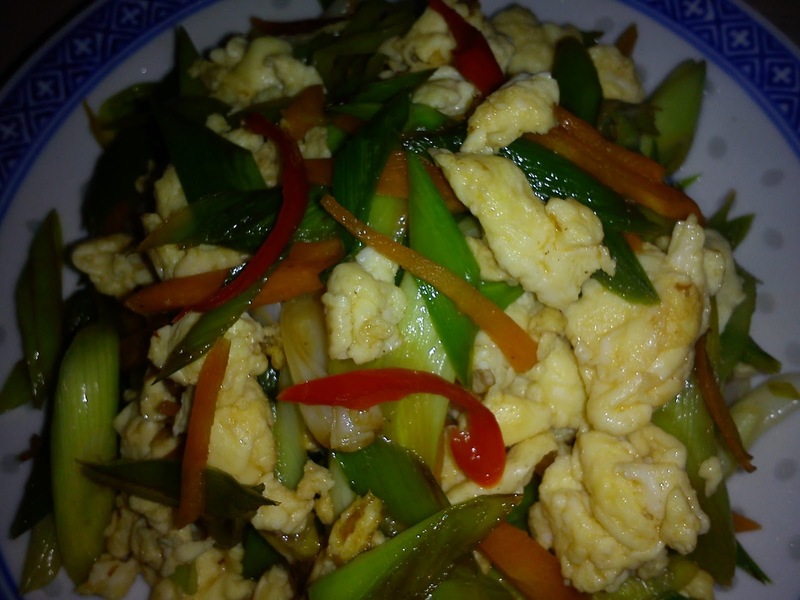 San Bei Chi is a fragrant and aromatic stir fry chicken dish, very popular is most Chinese food outlets. Normally served with rice but here I used it to cook with noodles. 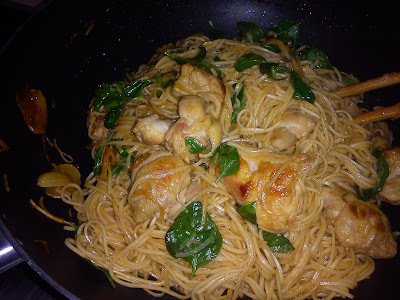 You can also used Angel Hair spaghetti. Verdict - tasty chicken and noodle dish that is not difficult to prepare. 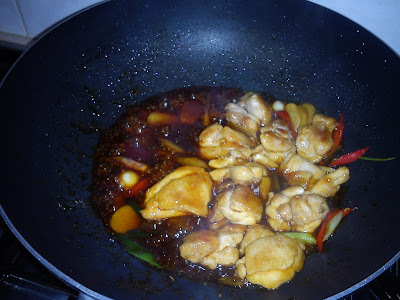 Heat sesame oil in a non-stick wok, pan fry chicken pieces until brown on both sides. Push aside. Add in garlic, ginger, spring onions and red chilli to fry until aromatic. Add in seasoning and 50 ml water. 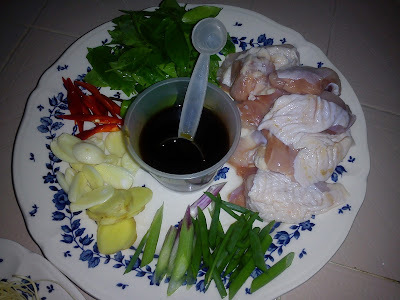 Bring to boil and braise chicken for a few minutes. Add in blanched noodles, toss to mix well and add in remaining water. 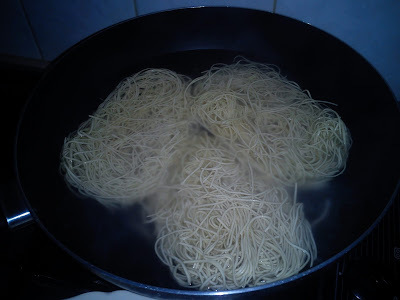 Continue to fry noodles until the water is almost dry. 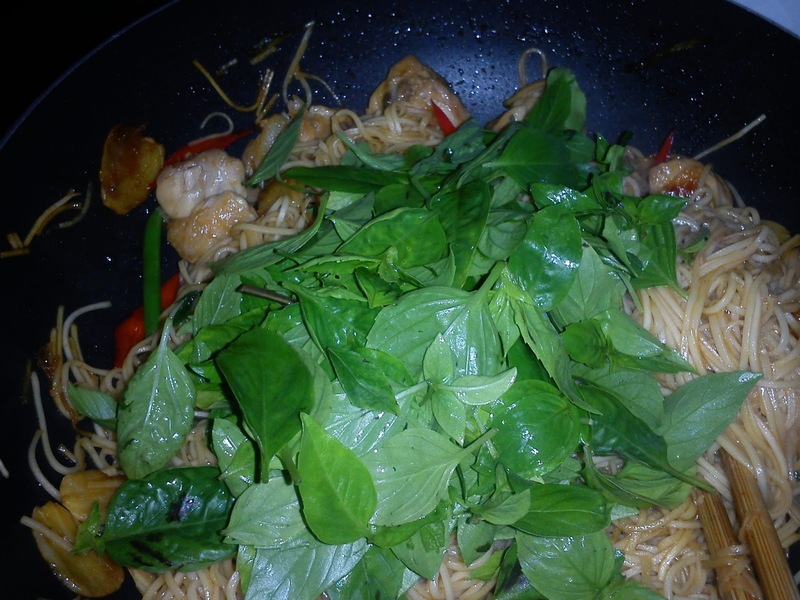 Add in basil leaves and toss well to cook. This is a pre-scheduled post. These mooncakes were made 2 weeks ago. It's a bit too early for mooncake making? Hmmm....but there's a reason. 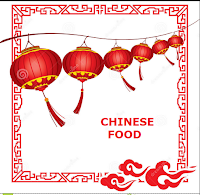 I'll be overseas by the time I'm back it is too near the Mooncake Festival and I wouldn't have time to make some. I intend to buy some while overseas. For a change, I decided to bake these cute mooncakes instead of the traditional baked mooncakes which many people think they are sweet and a piece is too big. Sure this is a hit with the family members as they don't have to share-share. Just two bites and it's finished. The colour comes from beetroot water* and I used savoury sweet lotus seed [ling yong] mooncake paste as filling. I may try using yam paste the next time I baked these again. The original recipe didn't use any colouring and I omit the egg glaze. In a mixing bowl, mix plain flour, sugar and salt until well combined. Add in cold margarine and rub with finger tips until it resembles bread crumbs. Gradually pour in the water/juice and mix into a soft dough. Cover to rest for 15 minutes. Divide into 10 portions [about 40 gm each] and shape into balls. Combine both ingredients in a bowl into a dough. This dough is quite dry and can be crumbly. Divide into 10 portions [about 15 gm each] and round up. Wrap oil dough with water dough, seal and roll into a ball. Finish doing the rest. Roll out a ball into an oblong shape [as thin as possible] and roll up like a Swiss roll. Repeat the rolling for another time and roll up like a Swiss roll. Finish doing the rest. Cut each piece into half, Flatten lightly with your palm, then roll out into a thin round [circular pattern facing up]. Wrap up filling, gather the edges to seal and shape into a ball. Place on a baking tray. Glaze with beaten egg, coat with sesame seeds [I omit this step]. 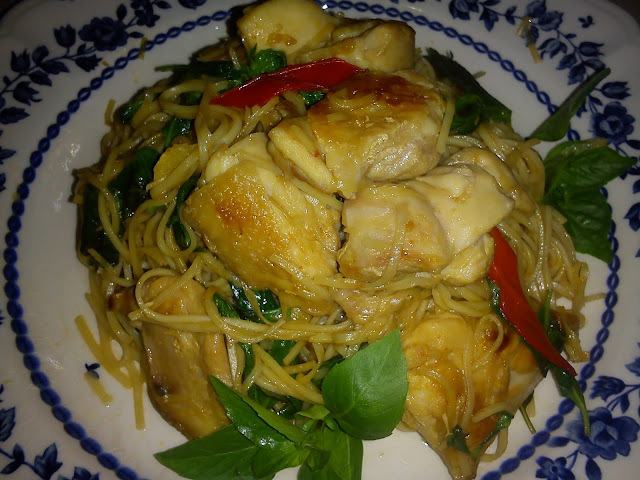 Bake in preheated oven at 180 degrees C [middle rack] for 20-25 minutes or golden brown.